I LOVED Mr. Penumbra! That was one of my favorite read this summer too! How did you like Requiem? I thought it was pretty good, but I absolutely adored Delirium, and was didn't really think either of the next two in the trilogy were as good. What a great list! I can't wait to start reading some of them. Thanks! Your'e awesome. I've read 15. One of my students wrote me and said he's read 100. I'm totally losing. I LOVE to read too. 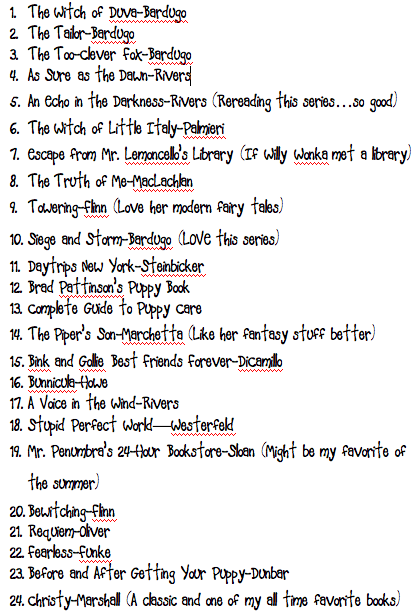 I think I read 8 novels the first week that school was out (I was rereading a series that I love)! Good luck getting caught up!! WOW! I'm so jealous...Maybe next summer I'll have more reading time!